Ozeki Phone System XE provides flexible, high capacity email services that take care of email messaging for your company and prove to be an effective add-on of modern telephone systems by improving corporate communication. The article below describes how you can use this advanced email messaging service and what configurations are needed to setup it in Ozeki Phone System XE. A new generation corporate communication system is required to manage the most advanced technologies - beside the standard communication channels - in order to make the workload easier and more efficient. The Internet that is the base of VoIP communication systems, allows the usage of numerous advanced services in a modern telephone system (Figure 1). Ozeki Phone System XE effectively integrates the standard and the new generation communication technologies to provide advanced services. This way, email messaging can also be handled easily in the telephone system. You can add the email addresses of registered users to the PBX among the other pieces of information. The system will send an automatic notification to the user's email box when a pre-defined event occurs. E-mail addresses can be assigned to SIP extensions; based on user permission, the user can determine the events when the PBX should send email notifications to the given email address. Ozeki Phone System XE also allows to send an email notification to the extension owner whenever a new voice message arrives to the voice mail of the called extension - in case it is a standard SIP extension. By configuring this functionality you can highly speed up message delivery. If you would like know more about how to setup voicemail service in the Ozeki Phone System XE please visit this page. In the conference schedule subsystem of Ozeki Phone System XE it can be set that the participants of a conference call will be notified about the details of the conference via email. Ozeki Phone System XE also allows to specify the parameters that will appear in the text of the email. These parameters may refer to the appointment or topic of the conference. The Ozeki Phone System XE provides a feature called System notifications in System preferences. It can be useful if you would like to be notified when an event occurred in your system like a new person available, the system has low disk space, new version available etc. And you can get these notifications via e-mail, sms and call. You can read more about the system notification of the Ozeki Phone System XE on this page. Integrated email messaging functionality in the PBX can be useful in cases when the software makes reports about system events. For instance, it may occur that in redundant phone systems the primary PBX shuts down and the secondary system automatically takes over its tasks. In this case, the system instantly notifies the staff about this issue via email so it can be quickly solved. With Ozeki Phone System XE you have the possibility to record your call converstations. And with this function of the e-mail messaging you can get your call records to your e-mail address easily. 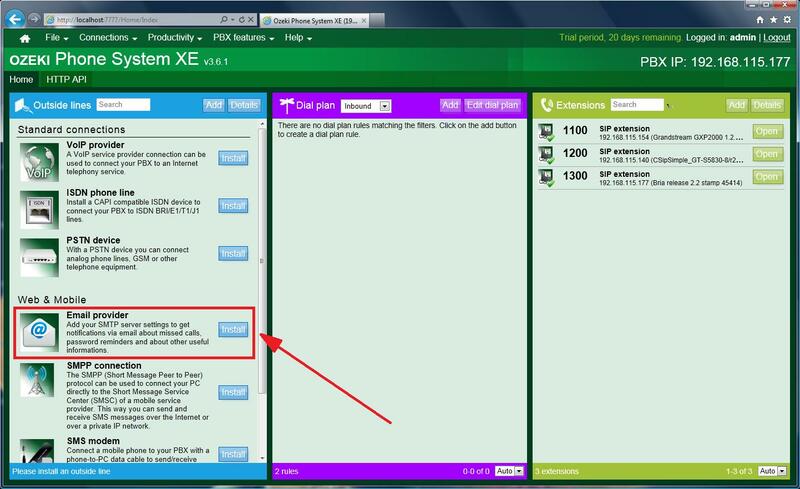 For more information about call recording please visit our How to setup call recording in Ozeki Phone System XE page. Beside email notifications, Ozeki Phone System XE also allows to send notifications to the mobile phones of users as SMS messages. Although, SMS messaging ensure that the information will be instantly received by the user, email notifications can include more data. SMS messages are better options if you want to be sure that the intended person will surely receive the notification. In this case, beside an email notification it is also possible to send an SMS notification at the same time. With this setting you can avoid that the user does not immediately notice the incoming email. Ozeki Phone System XE stores email data, which have been assigned for SIP extensions, in database tables. In these database tables the sent or scheduled email messages are also recorded beside the e-mail addresses. According to system settings, the database tables are periodically archived or deleted. 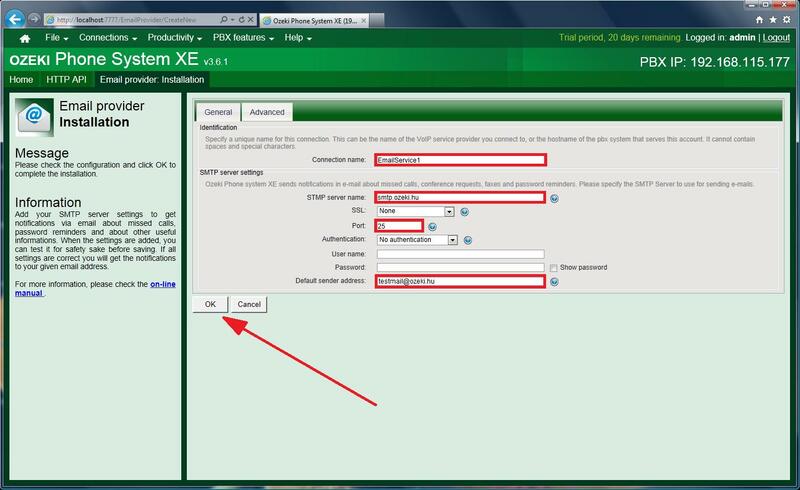 For installing the e-mail service quickly and easily in Ozeki Phone System XE please follow the steps below. 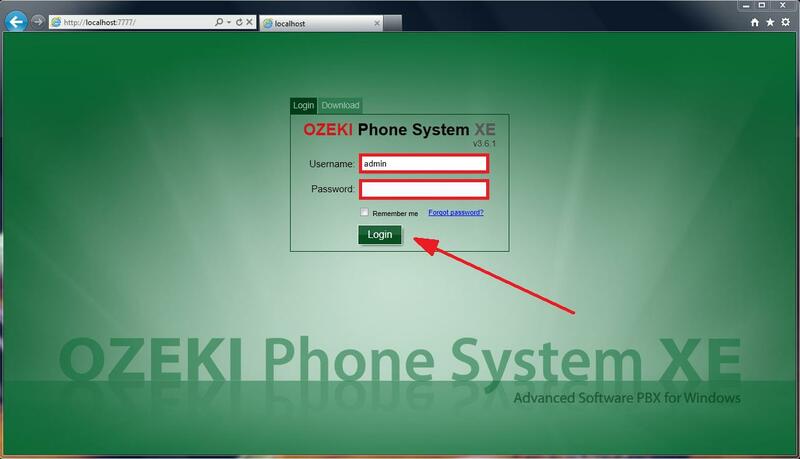 First, log into Ozeki Phone System XE by specifying your username and password (Figure 2). Before configuring the e-mail service, be sure that one or more Email Service Providers have already installed. If not, you need to add a new Email Service Provider by clicking on the 'Install' button next to the 'Email provider' box in the 'Outside lines / Web & Mobile' section of the GUI (Figure 3). For installing a new Email Provider some SMTP server settings are needed. On the configuration panel of the new Email Provider, enter the name of this connection. After that you need to specify the SMTP server name, the Port number and an email address as a default sender address. In case of using traditional email services, like G-Mail, Yahoo, etc., you need to fill out the other edit boxes as well. For this information please ask your Email Service Provider. Having done these steps, click on the 'OK' button (Figure 4). Now you need to add new dial plan rule. Beside the traditional telephone functionalities, Ozeki Phone System XE improves the corporate communication with additional services. In the system email addresses can be assigned to SIP extensions and in case of an event (new incoming voice mail, missed call, etc.) occurs, the PBX will send notifications to the specified email addresses. In some situations email notifications are very useful and due to the dynamic upgradability of Ozeki Phone System XE, personalized settings can also be added.